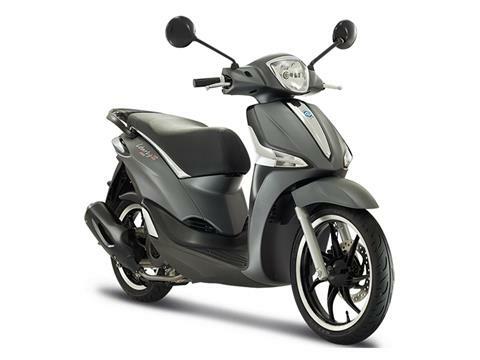 The Piaggio Liberty S 150 is the big brother of the family; the most elegant, captivating and top performing member. It's also the sporty brother to its twin and as with the other Liberty "S" models, it unabashedly comes in two strong, uncompromising colours: red (Rosso Opaco) and grey (Grigio Titanio Opaco) to create a striking effect with the black diamond-edge wheel rims and red-stitched seat. This is a scooter that demands to be looked at, with other elements in dramatic black such as the luggage rack, heat shield and mirrors. As with the other Liberty models, it's not all about looks, but functionality is important too. There is plenty of storage with a space under the rear shield and another, large enough to hold a full-face helmet, beneath the seat, a spacious foot board and handy bag hook. The instrument cluster combines analogue and digital technology. Last but not least, on the performance side, the Piaggio Liberty S 150 is powered by an air-cooled, electronic injected, three-valve single cylinder motor which uses i-get (Italian Green Experience Technology) and complies with Euro 4 emission standards. PLENTY OF STORAGE: There's no shortage of space on board the Piaggio Liberty S 150: there's room for a small piece of luggage on the footboard whilst in the rear shield you'll find a lockable glove box and under the seat (accessed electronically via a button) there is a compartment large enough to easily hold a full-face helmet. SAFETY FIRST: Nothing has been left to chance when it comes to safety: the wheels of the Piaggio Liberty S 150 are "16 and 14" respectively, the braking system is made up of a 240 mm disc and a rear drum and also includes an ABS anti-lock system refined by Piaggio together with Bosch, the world's leading manufacturer of automotive components. Safety and reliability guaranteed. TRAVEL IN COMFORT: The seat of the Piaggio Liberty S 150, with its eye catching and sporty red stitching is noteworthy for its roominess, making it extra-comfortable if you're travelling in two. Passengers will also enjoy being able to place their feet on the extractable foot pegs which fold neatly away into the sides of the scooter. 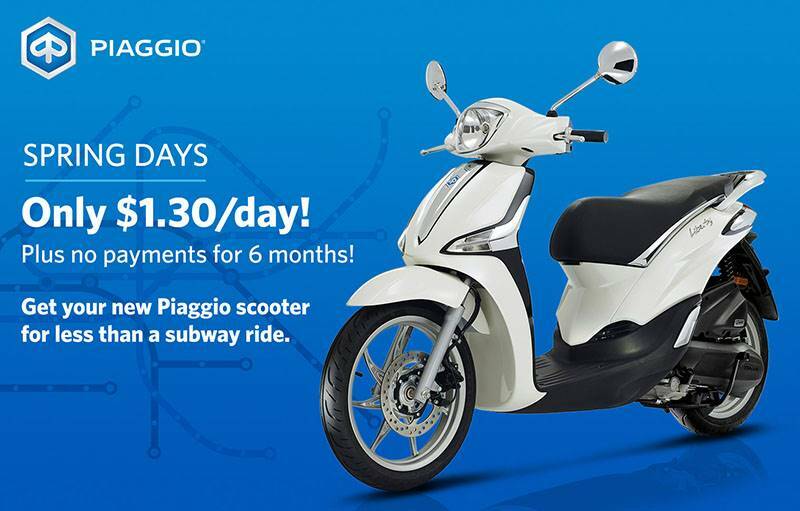 CHROME DETAILING: The electronic instrumentation of the Piaggio Liberty S 150 is made up of a classic analogue speedometer together with a more modern elegant blue LCD display which contains the fuel level, odometer and clock. 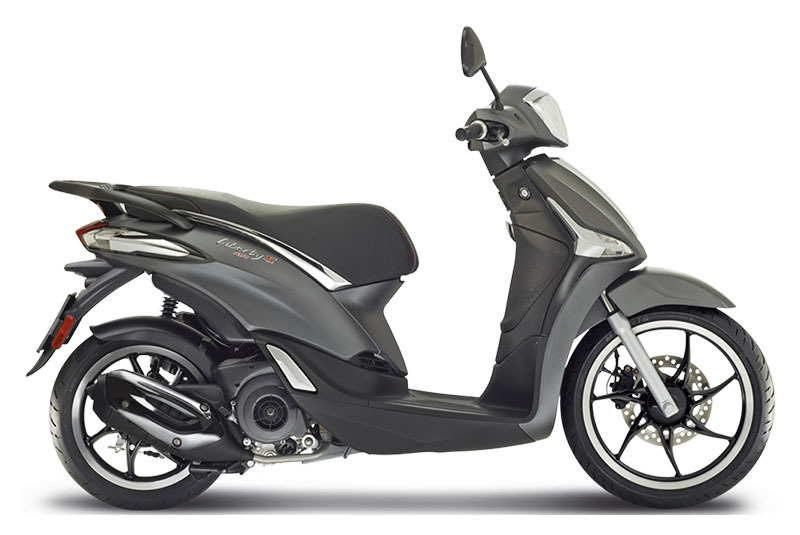 It's set off to perfection by a chrome frame which is the ideal complement to the vertical decorative ensign on the front shield and the chrome detailing on rear and front ends of the scooter.